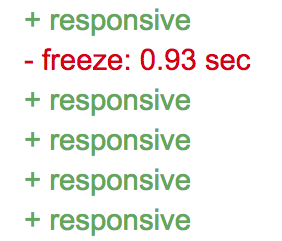 Let me highlight this again: web page is freezing for 26 sec, UI is completely not responsive. React-based web application with something like 20 items in search result. In Chrome, it’s not even IE8 back in the days. What you’ve done there, guys? Well, quite standard stack for these days right? Wait, what’s else there? Wait a sec, why you need both redux and mobx? Well, maybe it’s just a legacy, bad sign already, but, moving on. Quick go through some folders, entry points file. Let’s put few break-points here and there, few console.logs, get more knowledge about the code base and flow. Learn the code style. Learn main features and use cases. Where data is coming from? How it’s parsed and applied to UI? What are main UI components? Use React dev tools and inspect HTML elements to understand how layout is built. 15 minutes later.. you know the code base! Time to run Chrome profiler to measure performance. Scripting is quite heavy. No surprise though. What can we get from it? Well, if you ever ran Chrome profiler for a messy unknown code-base it can scare you at first. It is one of that scenarios when there is so much information on screen that you literally don’t know where to start. First of all, you can see that red marks on time line, that means there are real performance issues, even profiler can detect them without your analysis. Anyway, in profiler results I noticed mobx ,mobx-state-tree and one file from project code — journeys.js (as I mentioned, project is in tourism/traveling domain, so you will see some related names). 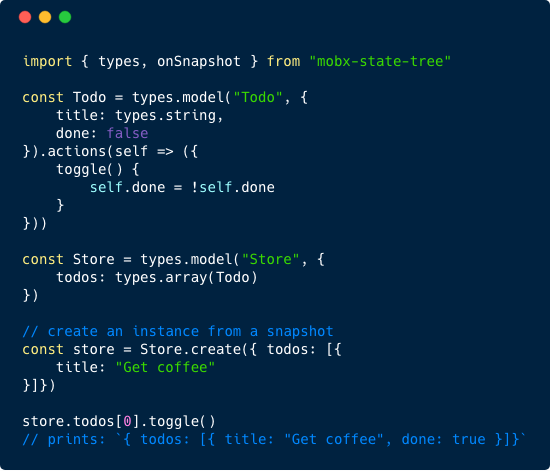 My first thought was ‘What is mobx-state-tree?’ since I hadn’t worked with it before. I did some googling, checked Github page, checked how it’s used in code — well, it’s libraries which provides you with tooling to wrap your data into models and combine them in one big model (tree). Then you just work with store object calling models methods to access or mutate its data. That was a moment when the first bell ringed. Since it is integrated with mobx and works based on observables I got a hunch that on big amount of models it might be a problem. At that moment of time I had no proof, and, I knew the number of models wasn’t that big, so, just moved on. Here how it works: when user press ‘search’ the session (based on search parameters, etc.) will be created. Then, server-sent events subscription will be created and will be pushing search results to you via events. If you think about that it’s pretty wise approach. Imagine your regular REST call when it takes quite some time to process result an send back to client. User, same as entire application, just waits for response back and blocked of doing other stuff (since data in not there yet). But, what if you can start responding to client right away, not waiting for entire task is finished? Yep, here we go, events based communications solve that. When message event received from server, JSON data will be parsed into object and passed further to callback which is our entry point of processing search results. No sooner said than done. I did search to get huge response, copied JSON, saved, mocked communications with server by it. I did have static data at that point, which is very important first step, because all measurement I was planning to do will not be compromised or polluted by changing data. “It must be about amount of data” — I told to myself. I mocked 100 items to search result (instead of 400 before) and, guess what? Hell no, it still sucked, not 26 sec, but still far from acceptable. WhaT a Fun? 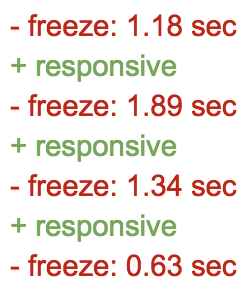 At one point I just removed entire rendering, meaning no react-renders at all, and performance was still same, i.e. awful. “Well, that’s even better, it will be simpler to fix in Vanilla JS, right?” — naive voice in my head wondered. Obviously, it has linear dependency to number of models.. They are combined in a tree-like way — ‘journeys’ model contains ‘routes’, ‘routes’ model contains ‘segments’, etc. So, let’s say, it creates 50 journeys, 100 routes for them + 75 segments. So it’s about 200 models. It takes 5sec to create them. “It’s time to get know you a bit better, my little friend” — thought I about myself and went to checkout Git-repo of mob-state-tree. I started from checking filed issues for repository. It’s a good practise do to that before putting a module as base for you application code. Well, too late here. I searched ‘perf’ in issues and got few . Quick go through. “It’s not only in my head, other people complaining about same thing”. But (again) we obviously can’t just wait until it’s released (and hope it has fixed performance) — guys need to release their app as well. Yesterday. Problem: models creation blocks JS thread, user can not see any updates on screen for 25 sec. How: chunks. Simple like that. Chunking approach is classic for handling big amount of data, long lists on UI, etc. You definitely used it many times in your applications: lazy loading, pagination — all the same idea. If you have heavy task you always can split it in portions (chunks) and do it chunk by chunk, taking a pause in between if needed. 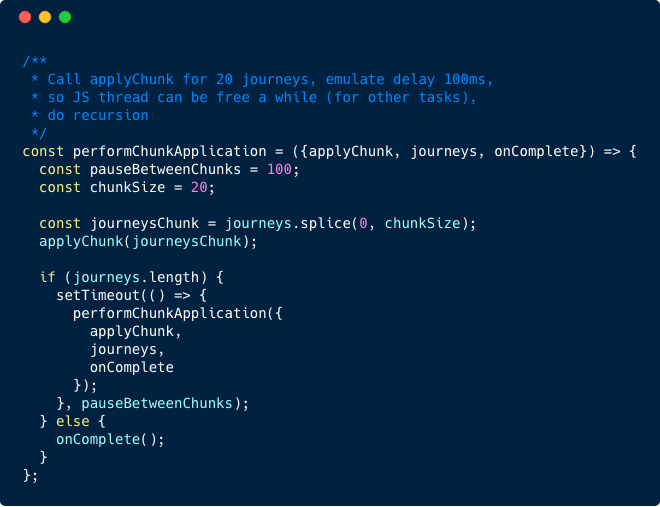 Applying to our situation, I was thinking to split data right after it was received into chunks by 20 journeys and then send chunk by chunk further, pausing in between for a while to allow UI to update. Easy Peasy. Simplified, just to get the idea. Task: create complete data structure from normalised arrays of models, i.e. search in long lists of objects by ID and combine objects together. Solution: well, definitely, if you come to data structures and algorithms complexity there are many ways of doing that. For search here ideal and the simplest way is to convert array into object with ID as key. You are getting O(1) search in 5 mins! After all, I felt like it should be working better now. How much better? I need a way to measure that! Here is a thing. You probably heard many times that someone ‘feels like’ that app is slow, without even knowing you profiling numbers and it doesn’t matter what your numbers says, user is not happy. Having not happy users is that last thing to dream about. The question is how you can measure user’s feeling. Apparently, this task is not that hard as well. User feels what works slower than expected, because, obviously, we all have precise feeling of real time. If your app’s behaviour distract real time, guess what, user will notice that. Knowing that, now we know how to measure user’s feeling — we should measure how our code works in compare with real time (I know, stupid simple for a theory). 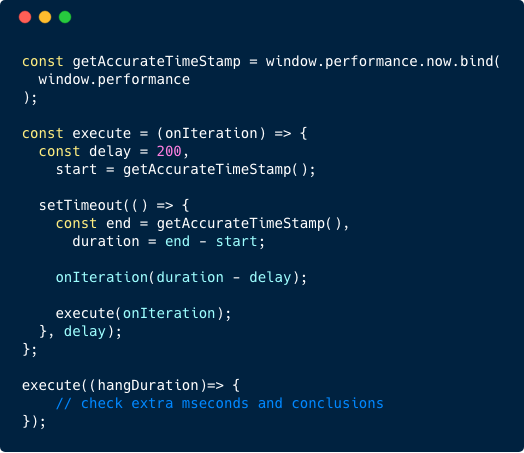 Run setTimeout (computer time) and measure how it differs from real time. If it’s quite different it means some of your code execution took more than allowed. You can find gist with complete code here. Well, definitely less than 26 sec.. So, here is the deal. The app has progress bar with timer (from 1–30 sec) on top of the page, which progresses when user does search. Timer should update each second, so user see how much time it takes. After: progress bar updates each second (so user can see all numbers from 1 sec to 30 sec), which is significant improvement. But, you can see on measurement above, it’s not smooth, since it creates 20 models for each chunk and it takes a sec per chunk on average to do so. If there are any animations on screen, it’s quite noticeable that something is wrong, 1.18 sec, 1.89 sec, delays… Apparently it’s not enough. Much better user experience, of course, but no, still not acceptable. “We can do better than that.” — I was challenging myself. What we know so far? Models creation is heavy task. Even for smaller amounts, in chunks, it still affects UI re-rendering. But… do we really need them all, all the time? That’s a good question which brings us to the second solution. 2nd solution: postpone heavy code execution (AKA ‘models creation’ here) until it’s impossible to wait anymore longer. There are 20 journeys in list on screen. On scroll we add more with step 20 as well, i.e. user scrolls down and gets more journeys. That means, from cold start we do not need more than 20 models. So.. why we even bother about other 700 models? Before: on pressing ‘Search’ button, progress bar updates each second (thanks to chunks). But, still, creation of 20 models for each chunk takes a sec on average, so progress bar hangs for that time, what is hard to not notice. After: progress bar hangs for 1 sec after pressing ‘Search’ button, but then updates each second perfectly smooth without any interruption. On scroll, though, it will hang for 1 sec again (since it will be another models chunk creation), but, this is a little evil we need to accept. Originally, it was 26 sec with blank screen for user to wait until the app is usable. After, with few very cheap fixes — the app is ready to use in less than 1 sec. Alright, that was an elephant in the room. It was too big to get rid of it, but with few decorations I was able to make it way less noticeable. But what about other code then? Remember times, when you did animation with jQuery, and it was lugging quite badly in Chrome, and, you still could do the same thing with ActionScript 3.0 (Flash) and it was way better and faster? Or, when you needed some big editable table to work in IE8, cutting here and there, using createDocumentFragment to reduce re-flows you finally were able to prevent browser to crash? Time flies and seems like just yesterday Microsoft launched Edge browser, no one give a damn about IE8 anymore… Amen. Yeah, what a relieve, finally drop support of 10 years old browser. So, what is the new thing to give a headache to front end developers? Mobile. In fact, it’s far not new, to be fair, the transformation happened very fast, shift of users from desktop to mobile happened like 3 or 5 years ago, right? Mobile browsers is our target audience now, so… please, stop testing everything on your new MacBook Pro! Performance is not something you can simply ‘apply’ in the end, sometimes it’s impossible or very expensive to fix consequences of bad code, application architecture or chosen libraries.